This neglected historic house gets virtually restored. 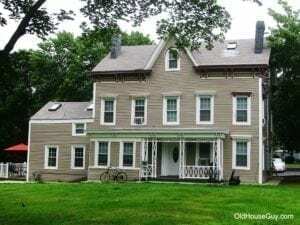 This Raritan Landing historic house is listed on the Historic Register but has unfortunately been neglected by the owner and Historic Preservation Commission. The citizens of Piscataway NJ entrusted this historic building, originally part of Raritan Landing , to the Historic Preservation Commission. They failed in their stewardship. See here how the Onderdonk house should look if it were properly cared for. Raritan Landing historic house gets new life. The historic John Onderdonk House dates to about the 1860’s, with an older section to the left. It is a contributing building in a neglected historic district in Piscataway NJ . Old houses are not for everyone and it is sad for this historic house to be in this condition. My purpose for performing this virtual old house restoration service was to inspire the Historic Commission to maintain their district. Raritan Landing Onderdonk house before restoration. Shows vinyl siding, cheap windows, enclosed porch, worn out roof, concealed foundation. Restored house with wood siding, period wood windows. foundation, slate roof, etc. 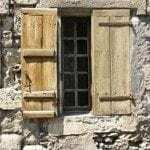 Wood shutters are needed. Shutters make a huge improvement. 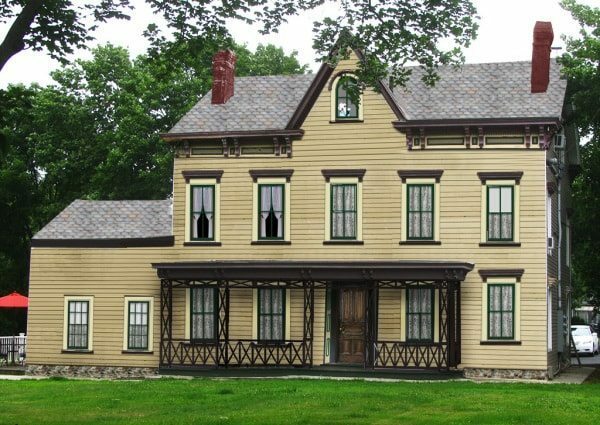 The restored Onderdonk house is now an asset to the historic district of Raritan Landing Piscataway NJ. This is what we did and why. Vinyl siding in a Dutch Lap style was removed and replaced with wood clapboard allowing the face of the house to properly align with architectural features. The additional layer of vinyl on top of wood siding causes features such as the window casings and frieze board to appear recessed. Removal of the extra siding layer corrected this problem. Notice the additional shadow lines. Although subtle, they do add to the overall character of the house. You no longer have that “tacked-on” look. Learn more about the effects of Vinyl Siding. Fake, plastic windows were replaced with true divided light, two-over-two double hung windows. In the older section, the original windows were six-over-six. Dark green window sash color is typical for the period enhancing the appearance of depth. 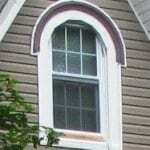 Learn about the design of windows. The arched window on the 3rd floor was retro-fitted with a plastic replacement sash that just screamed “wrong”. 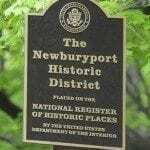 It is now restored back to its historic appearance. Louvered shutters were added to the main part of the house; solid-paneled shutters were added to the older section, on the left. There is a photo with and without shutters to show the impact shutters can make to curb appeal. Learn about shutter mistakes. There is a section of the porch to the left that was enclosed. I opened it back up and continued the balustrade to follow the porch roof, although I don’t believe the porch is original. Additionally, since the porch floor is so low, there was probably no balustrade between the posts, however they will remain for now. Learn about porch design. The Italianate frieze board features some nice colors, but when combined with the white vinyl, there is no possibility for this house to look good. The house colors (tans and maroon) used were based on the frieze board and are typical for the period. The vinyl siding extended down to the ground, concealing the foundation. A field stone foundation now provides the appearance of a solid base and makes the house appear stronger. A slate roof was added, chimney painted, and a period door replaced the “Home Depot” looking door. 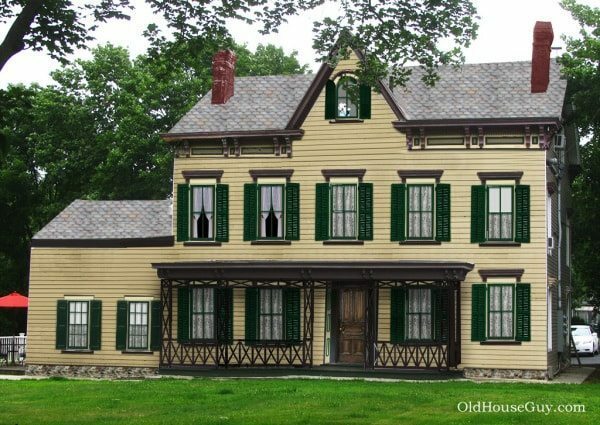 Does the Onderdonk house of Raritan Landing remind you of your house? Does your house also need some help? Caution homeowners! 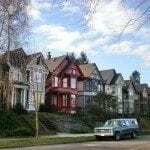 Please read this site completely before you make any changes that can harm the appearance of your house. 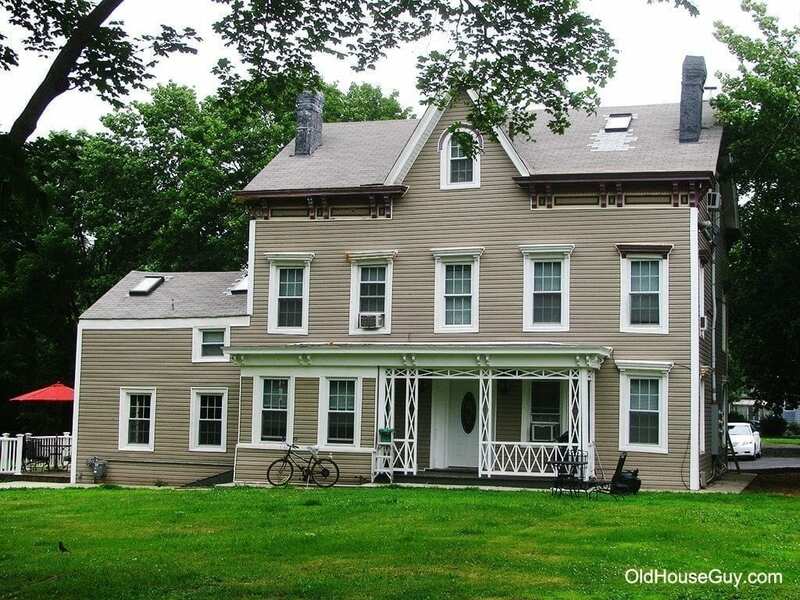 See some more examples of restoration, improvements, and what we can do to older homes.